Bedwetting can be a challenge that is difficult to overcome for children and parents. While you are glad your child sleeps well at night, not waking up to use the potty can be embarrassing and frustrating for your child, and a mess for Mom or Dad to deal with. Rolfie is getting to be a pro at using the potty! I am so proud of him because he just turned 3 earlier this month. While he can go without a diaper during the day time, night time is another issue. He gets very offended if I try to put him in a diaper after he has made such huge steps in being a big boy, but he still has accidents at night. We looked at sleep pants and nearly fainted at the price... then we discovered White Cloud Sleep Pants. Rolfie was a few pounds below the recommended weight on these, but after taking a leap of faith and trying them, I found they were a great fit for him and they offer exceptional night time leak protection at an affordable price. They have sizes which fits children from 45-125 pounds. For $7.75 you get 15 or 12 sleep pants depending upon the size you need. I expected a complete tantrum from my son when we put these on, but he said "Underwears!" He was ready to try them out, and was happy with the design, as he has a thing for stars. 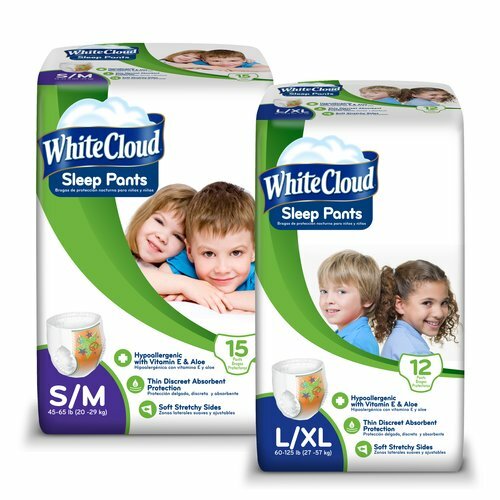 White Cloud Sleep Pants don't look or feel like a diaper. They are soft, they are not bulky and they seem like underwear to my son. They were absorbent, comfortable and we woke up with dry pajamas and a dry bed. The no frills design is a great thing, as you can use them for boys or girls. I think the price is just right for nearly any budget. Did you know that over 5 million kids a year experience bedwetting and it is one of the most common experiences during childhood development? White Cloud Sleep Pants have been developed to provide exceptional comfort and leakage protection while looking like underwear. White Cloud Sleep Pants offer thin, discrete absorbent protection for your child. They have soft, stretchy sides that fit like real underwear, plus leak guards to help protect against leaks. The soft inner liner is hypoallergenic and treated with vitamin E and aloe for skin protection. Each bag contains two unisex graphic designs and at $7.75, White Cloud offers exceptional value. This is a sponsored post written by me on behalf of White Cloud Sleep Pants.